As one of the fastest growing technologies in our culture today, data communications, and networking is a huge part of advancing business life into the future. Nelco Electronics provides all types of voice/data communications installations & services for growing businesses. Let us create a custom solution for you or your businesses needs. Voice & Data Cabling– Cat5e, Cat6, Fiber Optics, and Coax structured cabling. Audio & TV Cabling– Cat5e, Cat6, Fiber Optics, and Coax structured cabling. Security & Surveillance– Business/home security & surveillance cameras, CCTV cameras, IP cameras, Wi-Fi cameras, digital/analog cameras, DVR systems, and more. Lighting Control– Business/home lighting control systems & solutions. Energy Management– Business/home energy management systems & solutions. Surge Protection– Protect your valuable data communications & networking equipment with surge protection circuits & systems. 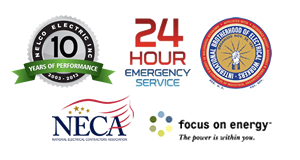 Emergency Power Systems– UPS(uninterruptible power systems), standby backup power generators, and more.